Thanksgiving weekend to take advantage of the long weekend and decided we would stay home and start to tackle this big milestone in his life together. I'll never forget it. I had prepared myself and read books and blogs and asked friends for all their advice – after all, it was a big milestone to conquer. I had always heard it was harder to potty train boys than girls. At the time I didn't know why, since I obviously only had Ben at the time. My son was able to go to the bathroom that Black Friday alone after an entire day of accidents... and a whole lot of patience. Still, it was taking longer than we initially thought. At around 7pm that day, we were giving up, truthfully. My husband, Dave, and I said to each other "ok this is not going to be as easy as we thought." We tried everything – bribing him with cookies and toys, we had him "play" and aim at the Froot Loops in the toilet bowl (true story!) and even sat him there for a long few minutes and prayed he would tinkle at least a bit. After a long day, lots of wet pants and dirty floors, Ben finally went to the potty alone and trust me, there was a big celebration that night. I will never forget that day! These are the really silly moments that as parents, we cherish for so many years to come. It is the first steps, first words and the first time they pee or poop in the toilet that truly have stayed in my heart and mind, and if you are a parent like me, you know exactly what that joyful moment does to our motherly hearts; our babies are growing up! It's pretty bitter sweet. 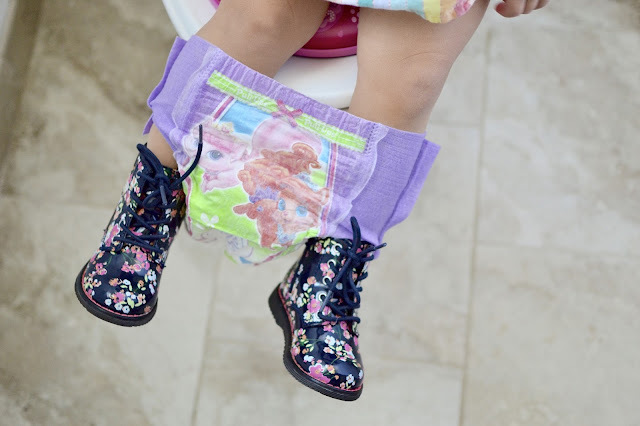 Emme’s potty training journey has only just begun, but I’ve already learned a lot about how to get started potty training with children of all personality types and tendencies. 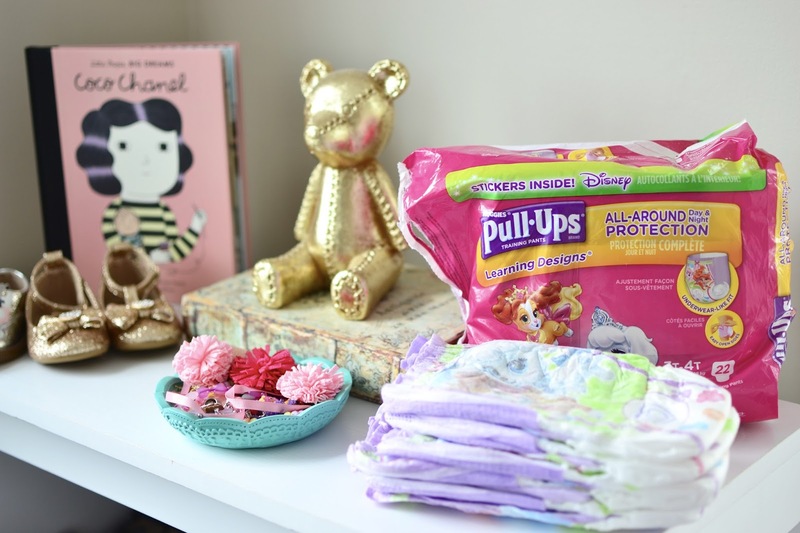 Today I am happy to share that I've partnered with Pull- Ups Training Pants to share my experiences potty training with both my son and daughter and give you 3 tips on how we got started. MAKE IT FUN. When Emme uses the toilet, we make it a big deal. We will cheer her on and clap for her and she gets so happy. It's truly a family affair. If you are a parent, you know exactly what I am talking about. There have been times when we are all in the bathroom and we all clap for her when she goes. Kids liked to be encouraged and told when they did something successfully. I recommend you always celebrate these moments, remember one day these moments in time will be precious memories and just that. It's important to note that we don't force her, we encourage her, I have realized it's easier for us to encourage her than tire her out by forcing her to sit on the toilet. Again all kids are different, with Ben it worked to sit him there for a few minutes at a time. This worked to make it fun for my kids, but I also visited Pull-Ups.com for more guidance on making it a truly exciting time for them – they have tons of sticker charts, games and tools to make sure it’s a fun experience for both parents and kids. USE TRAINING PANTS. For both of our kids, we've started using Pull-Ups right when they started showing signs of readiness. This is the top advice I give my friends and family when they ask for tips on potty training. It was just easier for me as they got older to use these, as opposed to regular diapers, which didn’t teach them any potty training skills. Once babies start to get active, you will see how much easier it is to use start and stick with Pull-Ups than any other diaper. The big plus? You’re getting your child used to the idea of big boy or big girl undies :) For us, they work great all day and throughout the night too, keeping Emme dry and comfortable. WHEN STARTING, USE YOUR HOUSE TOILET TO POTTY TRAIN. I know that this is all up to your discrepancy or choice but hear me out, it's almost redundant to buy a standalone potty seat and to me, a waste of time to buy a potty to then have to show your child for a second time when they are older to now use the actual toilet. With both of my kids we purchased potty seats that go on the actual toilet and trained them that way. It's a one shot deal and you don't have to clean up a second mess on the potty. This is just my opinion and ultimately, you should use what works best for you and your family. 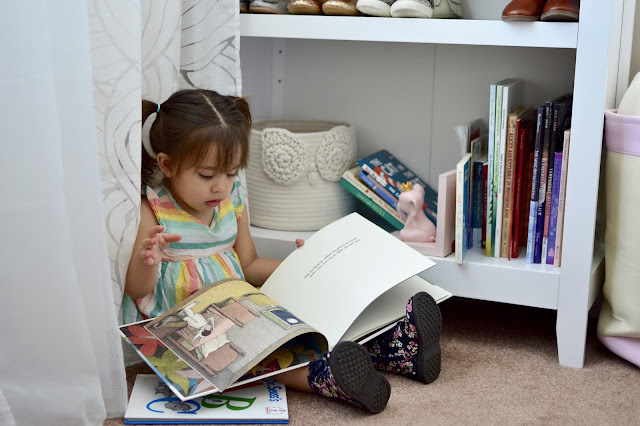 If you want more specific advice, please feel free to leave a comment below or email me and visit Pull-Ups.com to check out their tips, tricks and advice to help you get started potty training and make it FUN! . Stay tuned because I will be sharing more tips and ideas on potty training and bringing you along for Emme's potty training journey, I hope she doesn't hate me for this one day! 2) If you wanted to limit the amount of accidents for Ben, would it have been easier for you to buy training pants for him as well? 3) Do you hope that Emme will have less accidents than how you did with Ben?